In our house, if you want to make something for the boys that will be universally popular, there's really only one thing that will cut it. With a little bit more hidden inside, if possible. I wanted to try and make a plain chocolate cupcake into something that the boys would love. And they loved these. These are a soft, fluffy sponge, with a hidden chocolate sauce centre, covered in rich chocolate buttercream. Not too sweet, they really hit that chocolate spot. Even Sam joined in, as I had enough of the sponge mix and buttercream left over to make 10 little bite-sized cupcakes. Just perfect for a toddler's chubby grip. The sponge is my trusty basic chocolate recipe. You can make it as an all-in-one, and chuck the ingredients into a bowl and blitz with a hand mixer. I tend to adapt the method slightly, though, creaming the sugar and butter first. I just think that if the sugar dissolves into the butter properly, it gives a better texture. Either way, I've found the recipe always works for me. Preheat the oven to 160 Fan / 180 Conventional / 350 F / Gas 4. Prepare a muffin tin with cupcake cases. In the bowl of a stand mixer, cream together the butter, salt and sugar for the sponge until pale and fluffy (a good 5 minutes or so). Add the eggs a little at a time, until they are mixed in. Add the flour, baking powder and cocoa and mix gently in until you have a just-combined batter. Add the milk to slacken a little and until just mixed in. Scoop into the prepared cases. I use an ice cream scoop that I know gives a perfect sized cupcake (it's one with a 2 inch diameter scoop). With this amount of batter I get 12 large cupcakes (using muffin cases) and either about another 3 large ones or 10 mini bite-sized ones. Bake in the centre of the oven for about 18-20 minutes, until risen and a skewer inserted into one in the middle of the tray comes out clean. Remove from the oven and allow to cool for a few minutes, before turning out onto a wire rack to cool completely. While they are cooling, make the buttercream. Melt the chocolate in a bowl - I just heated in the microwave for 30 seconds at a time (on full), sirring between each blast, until it was almost melted. Keep stirring to melt the last little lumps of chocolate, and then allow to cool a little, so that it's tepid if you dip your little finger in. In the bowl of a stand mixer, fitted with the paddle, cream the butter and icing sugar until smooth (it was quite thick at this stage). Add the melted chocolate and beat again for a few minutes until it's really smooth. You can add a little milk (say 1 tblspn) if it seems too thick. To assemble the cupcakes, take the completely cooled cakes and cut a hollow out of the middle (I used a cupcake corer, but you could use an apple corer, or melon baller - you just need to be careful not to go all the way through to the base). Pour a little of the chocolate sauce into each cupcake, so that you fill the hole. The sauce I used is one from Rowse's 'Signature' range, which I found in my local Asda. The reason I used this is that it is really quite thick, so there was no danger that it would soak into the sponge too much. To give you some idea, it was so thick, I had to tease it from the bottle using one of those wooden coffee stirrers. Rowse do a fudge sauce as well, which is heavenly and which I use to fill Sticky Toffee Cupcakes in the same way. The little pieces of sponge are chef's perks, so enjoy. Top with the buttercream. You can either pipe swirls or just scoop it onto the top. I *tried* to pipe swirls with a Wilton 2D tip and for the first time, it let me down a little. The little spokes on one side of the star tip had been pushed together somehow - my clumsy washing up probably - so the icing spurted a little out of one side, rather than flowing in its usual creamy ruffle. I left them plain at that point, but I was toying with the idea of drizzling some melted dark chocolate over them and letting it set. Maybe next time. For the mini cupcakes, I didn't bother with filling those and just added a little star of buttercream to the top. The boys went absolutely crazy over them. It was a pretty good - and easy way - of jazzing up some cupcakes into something special. 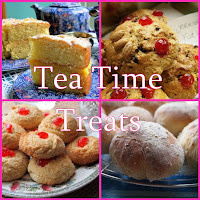 As this month's Tea Time Treats theme is Fairycakes, Cupcakes and Muffins, I'm going to submit these to Kate, at What Kate Baked, and Karen at Lavender and Lovage. You can check out all the other mouth watering entries over at Kate's blog. P.S: In case you're interested the wire cake stand was a fantastic bargain I picked up recently in Hobbycraft for £7.99. I just love the little heart details and it's just perfect for cupcakes. Love the idea of the gooey filling - simple to do but gives a great effect! And your icing skills are so professional as always! These look great and your piping is lovely too! Oh wow, no wonder your boys loved these! They look seriously good! Love that oozing chocolate sauce centre! and your cake stand is awesome - what a bargain indeed! I can see why these were a big success! Love the sound of an oozy chocolate centre. This post has now given me massive chocolate cake cravings! These look amazing - good tip using the icecream scoop to measure the exact amount in each cup cake case. Can't go wrong with chocolate cupcakes! Love the cake stand especially with the heart detail. Your cupcakes look absolutely gorgeous- I particularly like the hidden surprise :) my chocolate cake tonight was a fail as I forgot to put sugar in!! oops! Chocolate with hidden chocolate?! No wonder chocolate is universally popular in your home Susie! Thank you for entering these into TTT! These cupcakes look amazing! I'm going to make them for my sister-in-laws birthday. Could you please explain how to change grams to the US equivalent? I never can remember. This time I'm going to write it down & put it someplace safe. Thank you!